As one of the very few fully integrated watch manufactures in the world, Grand Seiko possesses a mastery over the full breadth of the watchmaking process from the research and development of component materials to manufacture, assembly, adjustment, inspection and shipment. Grand Seiko defines the essence of watchmaking in the elements of precision, beauty, legibility, durability and ease-of-use. As a world-leading watch manufacture, Grand Seiko embodies that very essence in the unrivaled quality in every Grand Seiko watch presented to the world. Each of these pre-eminent watch studios plays a pivotal role in combining the cutting-edge technology and masterful craftsmanship necessary to reach the pinnacle of quality represented by Grand Seiko. The Shizuku-Ishi Watch Studio located in Iwate Prefecture plays a key role in the production of Grand Seiko mechanical watches. A true manufacture, the studio's craftsmen oversee the design, manufacture, assembly, adjustment, inspection and shipment of critical mechanical watch components including hairsprings. The studio is composed of expert craftsmen and women, several of whom have won recognition as Contemporary Master Craftsmen*1 and receipt of the prestigious Medal with Yellow Ribbon*2. The combined excellence of their craft has made it possible to achieve the world's foremost mechanical watches. With some 200 individual parts, Grand Seiko mechanical watches must exhibit a near-perfect consistency of functionality in each of these parts to ensure the precision of the final timepiece. Manufacturing technology allowing for high-precision parts is complemented by the sheer skill of craftsmen and women able to make precise adjustments by hand to tolerances of up to one hundredth of a millimeter range, yielding countless masterpieces each with their own unique place in the history of mechanical watches. An annual award conferred by the Ministry of Health, Labor and Welfare to honor technicians with outstanding skill in their respective fields. An award conferred by the Cabinet Office of Japan to individuals for their diligence and achievement in fields including agriculture, trade, and manufacturing. The Shinshu Watch Studio produces Grand Seiko’s Spring Drive and quartz watches. It has a unique mastery of craftsmanship and high technology micro-engineering. The quartz models in the Grand Seiko collection are significantly more complex than standard quartz watches, and can only be handcrafted by expert watchmakers. The Shinshu Watch Studio pioneered the combination of superior technology and craftsmanship which gave rise to the world's first quartz watch, and it continues to produce the ultimate in innovative quartz watches. Over twenty years in development, the exclusive Spring Drive mechanism began as a revolutionary concept in watchmaking and only came to fruition through the technological expertise of a true watch manufacture. Spring Drive continues to evolve today. Advanced models have pushed the limits of complication and accuracy, including a Spring Drive Chronograph with stopwatch functionality and the Spring Drive eight day power reserve. 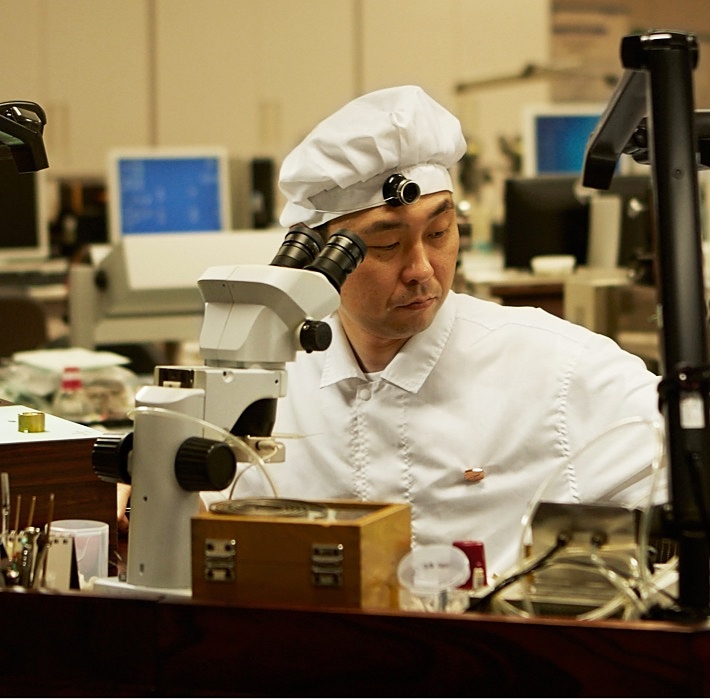 The Shinshu Watch Studio boasts world-leading craftsmanship, with mastery of techniques such as Zaratsu polishing, which creates the sharply defined edges and seamless mirror finishing that is the signature of Grand Seiko.